Since 2012 we have sponsored the Duchenne Research Prize at the World Muscle Society’s annual international congress. 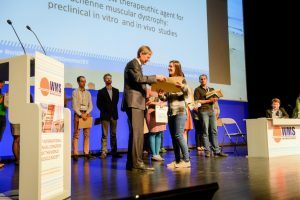 The award recognises the work of a young Duchenne muscular dystrophy researcher. 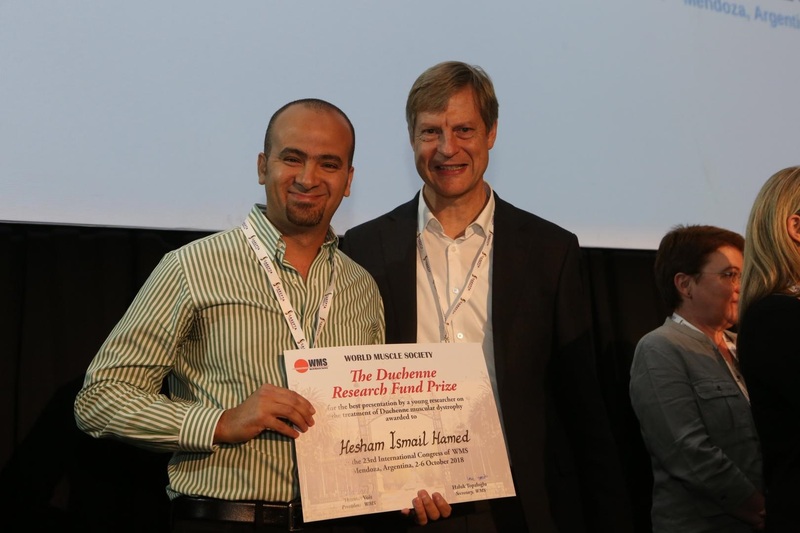 The winner at the 23rd congress in October 2018 in Mendoza, Argentina, was Heshim Ismail Hamed. He is pictured here receiving his prize from Professor Thomas Voit, President of the World Muscle Society and Director of Great Ormond Street Hospital Biomedical Research Centre. Dr Patricia Piñol Jurado won the prize for her research entitled: ‘Nintedanib as a new therapeutic agent for Duchenne muscular dystrophy: preclinical in vitro and in vivo studies.’ She is pictured here with Professor Thomas Voit, President of the World Muscle Society and Director of Great Ormond Street Hospital Biomedical Research Centre. Dr Michel Abou Samra won the prize for his research on the potential therapeutic action of adiponectin in Duchenne muscular dystrophy. Dr Caroline Le Guiner was awarded the prize for her research showed that gene therapy benefited dogs with Duchenne muscular dystrophy. Dr Nicholas Wein was awarded the prize for his presentation of research relating to Duchenne mutations.